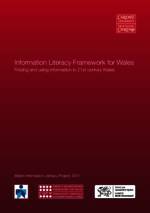 The Information Literacy Framework for Wales has been endorsed as representing a unified approach to supporting and embedding Information Literacy within education and training in Wales. It is envisaged that this Framework will provide a clear and integrated development structure for practitioners delivering Information Literacy at all levels. Please choose the section of the document you would like to read from the options on the left hand menu, or to print a copy please use the PDF version below. This document is intended to provide a consistent and joined up approach to information literacy accross all sectors in Wales.